After Morecambe’s Frontierland theme park closed in 1999, the eastern end of the site was redeveloped as the Central Drive Retail Park. The western seafront end remained mostly derelict, although the Ranch House bar continued to operate. The landmark Polo Tower enjoyed a second lease of life as a mobile telephone mast. 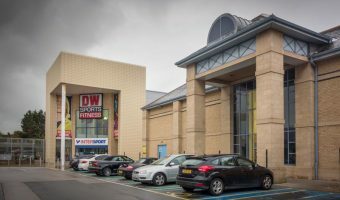 In November 2014 Lancaster City Council approved plans to develop the western section as the Bay Shopping Park. It is scheduled to open in 2016. The park will be home to around thirteen stores and a car park with space for over 300 vehicles. Tenants could include TK Maxx and B&M Bargains. The Ranch House bar will be demolished and replaced by a Premier Inn hotel and a Brewers Fayre pub and restaurant. The Polo Tower will also be knocked down.